Cookies: 365 Days of Cookie Recipes (Cookie Cookbook, Cookie Recipe Book, Desserts, Sugar Cookie Recipe, Easy Baking Cookies, Top Delicious Thanksgiving, Christmas, Holiday Cookies) est le grand livre que vous voulez. Ce beau livre est créé par Emma Katie. En fait, le livre a 202 pages. The Cookies: 365 Days of Cookie Recipes (Cookie Cookbook, Cookie Recipe Book, Desserts, Sugar Cookie Recipe, Easy Baking Cookies, Top Delicious Thanksgiving, Christmas, Holiday Cookies) est libéré par la fabrication de 365 Days of Cookie Recipes - Healthy Living Lifestyle Cookbook. 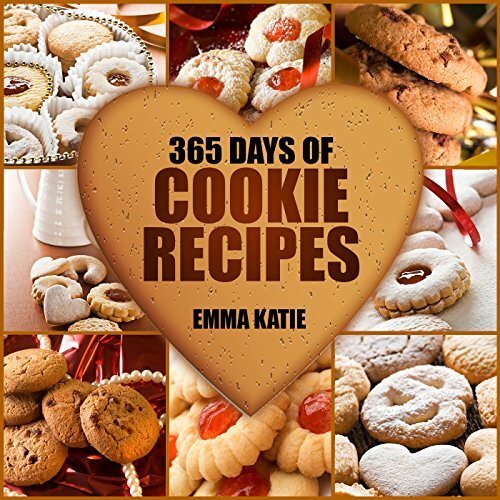 Vous pouvez consulter en ligne avec Cookies: 365 Days of Cookie Recipes (Cookie Cookbook, Cookie Recipe Book, Desserts, Sugar Cookie Recipe, Easy Baking Cookies, Top Delicious Thanksgiving, Christmas, Holiday Cookies) étape facile. Toutefois, si vous désirez garder pour ordinateur portable, vous pouvez Cookies: 365 Days of Cookie Recipes (Cookie Cookbook, Cookie Recipe Book, Desserts, Sugar Cookie Recipe, Easy Baking Cookies, Top Delicious Thanksgiving, Christmas, Holiday Cookies) sauver maintenant. Everyone loves cookies, whether they are crisp or chewy, soft or crunchy. Despite their simple look, cookies are glorious through their taste, texture and the ease of storing and they sure bring joy to every house! Cookies are well-known around the globe and can be found in every culture gracing the tables in all sorts of occasions. What makes them unique is their versatility. Every recipe is a new opportunity to experiment with ingredients, try out new flavor mixes and play with textures. -The best cookie recipes you will ever make and taste! -How to make various types of cookies. -Easy recipes that even beginners can make. The 365 recipes found in this book are mouth-watering and make excellent gifts for your loved ones! Because that’s the essence of it all! Sharing cookies with your family, friends or simply strangers is the best feeling ever! It does bring a certain fulfillment that nothing else can! Allow yourself dive into the world of cookies and enjoy every bit of it!